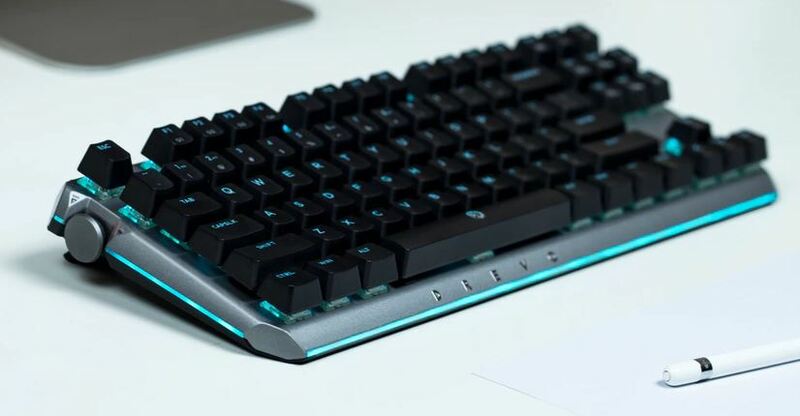 DREVO BladeMaster Review – The Ultimate Wireless Mechanical Keyboard? There is no denying that Apple products are gorgeous machines. They are beautifully designed and typically feature smooth and powerful performance, but their keyboards leave something to be desired. If you’re a fan of mechanical keyboards, but prefer using Apple over PCs, you know how disappointing Apple’s new keyboards can be. Apple keyboards use proximity sensors instead of mechanical pieces, which doesn’t quite have the same sort of tactile response as a well-made mechanical. Our search for the perfect mechanical keyboard has been long and storied. Most recently we reviewed the Gamdias Hermes M3, which is a low-profile device with a slew of customization options. You can also check out our list of the best mechanical keyboards, which is a few years old at this point, but still holds true for great quality. Since our quest continues to this day, we’re still on the hunt for the keyboard that steals our heart. Have you ever wanted something so bad that it physically hurt? 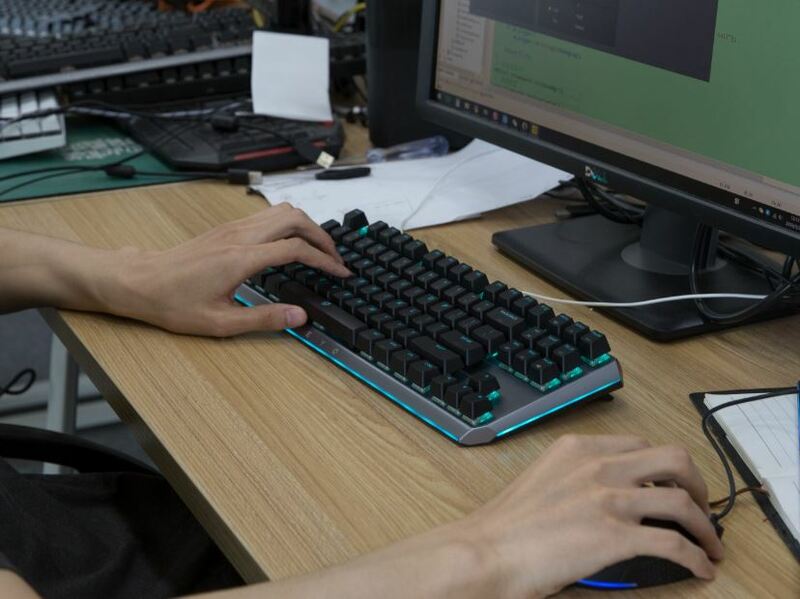 That’s how we feel about the Drevo BladeMaster, a wireless mechanical keyboard that was designed based on a 14-month research journey asking thousands of gamers and keyboard enthusiasts which features their perfect mechanical keyboard would have. The result is a Kickstarter gadget which has already earned funding of over $160,000, with an initial goal of $20,000. 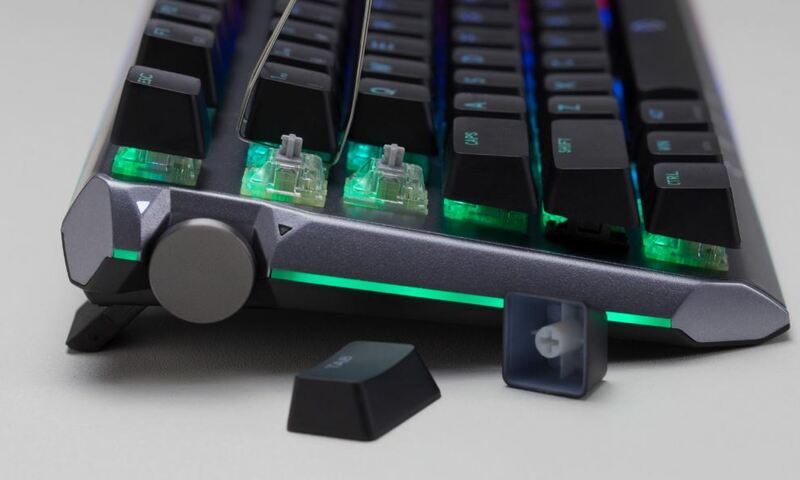 Clearly Drevo has struck a chord with fans of mechanicals. We were recently given the opportunity to have a hands-on demo of the BladeMaster. Over the past week we took Drevo’s masterpiece for a test drive, putting all of its features to the test and analyzing the device’s specs. Since we have had the opportunity to use more mechanical keyboards than most, we feel like our review will be helpful. Here is our completely honest review of the Drevo BladeMaster. Wireless mechanical keyboards are a relatively new addition to the gaming community. There have been several other attempts at creating a wireless alternative, but every single one of them is lacking in other ways. For example, the Logitech G613 features macros, but are not TKL (they include a number pad). On the other hand, the Corsair K63 is TKL, but lacks macros. Even more disappointing, neither of those options include one of the coolest mechanical features, RGB lighting. Why hasn’t anyone gotten it right yet? Drevo appears to be the first one. The BladeMaster features these specs and more. 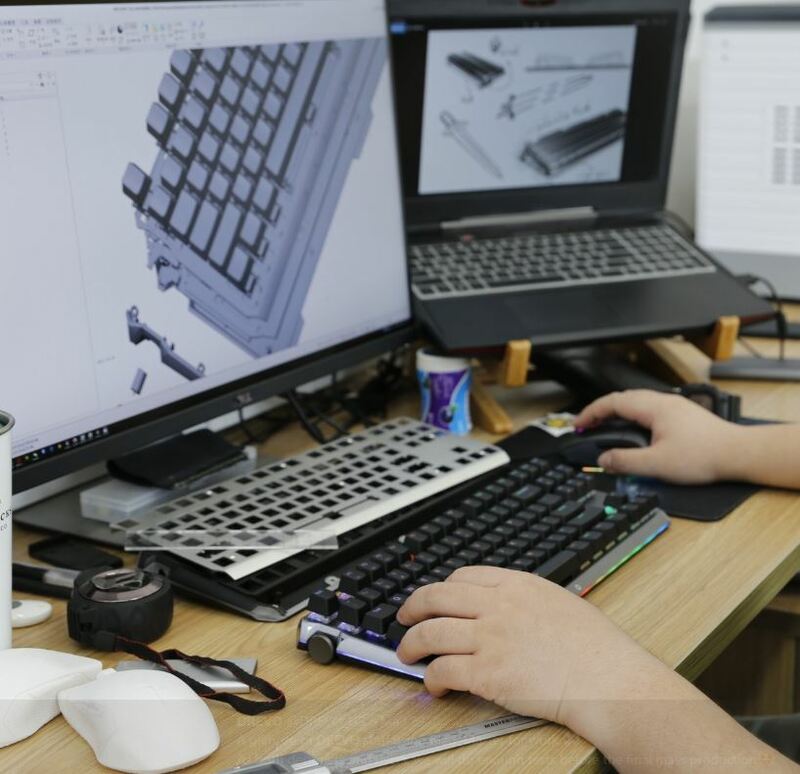 Keep in mind that Drevo will offer two different versions of the device, the PRO and the entry-level TE. For our purposes, we’re going to be focusing on the PRO. Let’s take a closer look. Included in the BladeMaster packing is a USB-C to USB 3.0 cable, a keycap puller, a 2.4 GHz USB receiver, a dust sheet, a small brush for intricate cleaning and an awesome little logo sticker which we immediately stuck onto the lid of our laptop. The entry-level TE version is not wireless, so instead of a USB receiver, it ships with a USB 2.0 cable, and doesn’t include the USB-C adapter. The BladeMaster is manufactured using Germany-made Cherry MX RBG switches, which come in your choice of Red, Brown, Black and Speed Silver. The keyboard ships in a wide variety of language formats, including United States English, UK English, Italian, Germany, French, Spanish, Japanese and Korean, because everybody loves a well-designed gadget. The BladeMaster’s wireless feature is powered by your choice of the included 2.4 GHz USB receiver, which provides blazing fast wireless speeds, with response times as fast as 1ms/1000Hz, or through Bluetooth 4.0, if your computer is Bluetooth ready. If you’d like to switch between the three available connection options, the BladeMaster features hot switching which lets you quickly rotate with a few short motions. The processing power is provided by the 32-bit Arm Cortex-M0, which can clock speeds of up to 75 MHz. A 16 MB external flash drive helps manage your data and store any essential files you chose. One of our favorite features of the BladeMaster is the programmable touch-typing knob. This keyboard isn’t only for gaming. The Genius Knob can increase your productivity while performing a bunch of activities, including programming and office work. The special knob helps control the keyboard when your other hand is busy with the mouse. You can program the knob to handle any right-hand keys, as well as macro and batch script processing functionality. The knob is programmed using the Drevo Master Console software. The Genius-Knob is capable of handling four different functions, which are activated by single clicking, double clicking, or spinning the knob forward or backward. When we were playing World of Warcraft (yes, we still play WoW. Wanna fight about it? ), we hot keyed the knob to activate the map function, which was a lot easier than swapping our hand back and forth. The knob not only made us better gamers, but made us more productive and efficient in general. The knob truly does feel genius. If you’re a programmer, the Genius Knob comes in handy when you need to consistently run several scripts repeatedly. You can program the knob to launch four difference scripts on demand, without having to use command or a file browser. All of those wasted hand stroked add up to a whole lot of wasted time. There is something about a well-lit customized keyboard that makes us extremely happy. People who are unaccustomed with RGB keyboards don’t understand how important they can be to gaming, especially if you prefer to play in the dark. By programming the most common action keys with a unique color, you can easily re-find the buttons when you move your hand to other keys. It’s actually very helpful. 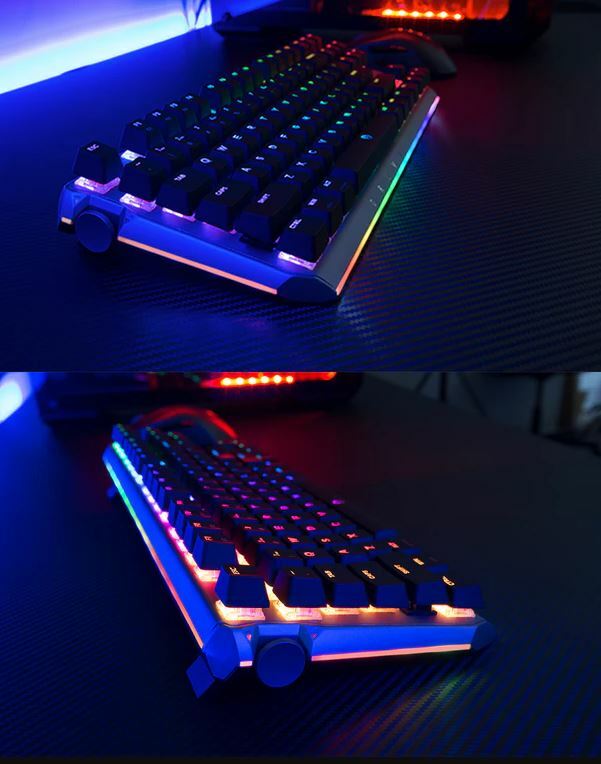 The BladeMaster’s RGB lighting is powered by Drevo’s Radi Lighting System, which features 360-degree lateral middle embedded light bands. Using the Radi system you have the option of programming keys with 16.8 million unique colors. Who even knew there were that many colors? In addition to the massive variety of colors, the BladeMaster features 9 different lighting modes, color customization for each unique key and dual lit overlay. The programmable mode offers every configuration from solid unchanging color, to an almost strobe effect. There’s an effect for whatever your preferences might be. Our preferences tend to change by the hour, so the BladeMaster’s multiple modes made us very happy campers. The BladeMaster features a host of features specifically geared towards keeping your wireless connection fast and your latency low. As we mentioned earlier, the included 2.4 GHz wireless USB adapter allows the keyboard to hit speeds of up to 1ms / 1000HZ. In addition, the device features frequency hopping tech, which prevents extra, unusable signal frequencies from affecting the wireless speed. The USB adapter connects 1 on 1 with your router, allowing the signal to be streamlined directly to your device, improving your data security. And speaking of security, you’ll also get encrypted transmissions, ensuring your private keystrokes stay private. The BladeMaster is powered by Drevo Power Console, a full-featured cloud based application with a lot of neat customization and stat features. In addition to controlling the Radi RGB lighting system, the software can also be used to set macros and program the Genius Knob. The Power Console also keeps track of your daily typing habits, allowing you to few your keyboard usage stats. You can also manage up to three different keyboard configuration profiles, so multiple people in your household can set different preferences, or you can set different preferences depending on your activity. You might be wondering why you need 16 GB of on-board flash memory on a keyboard. The answer is convenience. If you don’t want to have to download the Power Console software every time you’re using a different computer, you can store all of your preferences right inside the keyboard itself. You can activate different profiles by using the function keys. This comes in handy if you frequent cyber cafes, LAN parties or gaming competitions. Not being able to use your customized preferences can be disorienting, which will almost certainly affect your gaming chops. The on-board memory ensures you’re always comfortable. 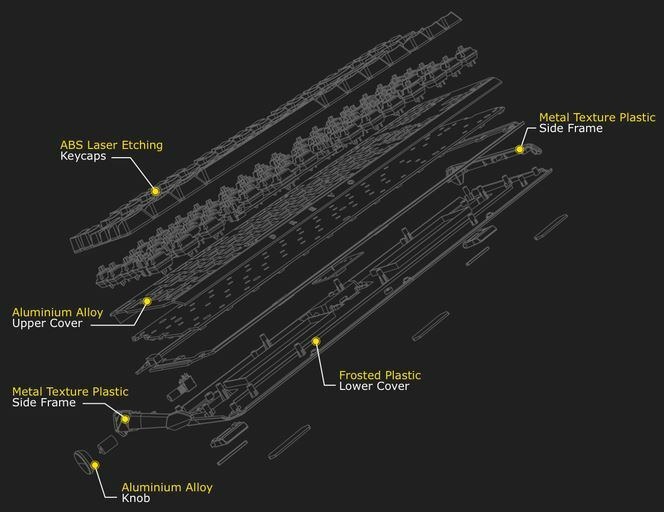 The BladeMaster features several design functions which help improve your keyboard experience. First off, the device just looks awesome. The TKL interface is concise and compact, while providing all the features you need. The device measures in at 14.5 in. x 5.4 in. x 1.77 in and weighs about 2 lbs. It truly is the perfect size, not overly large with unnecessary frills that keep your mouse hand further from the main keys. The BladeMaster also features a foldable stand which can hold the keyboard up at an angle if you prefer a little lift. The bottom of the keyboard features 5 non-slide rubber pads, which helps keep it stable during intense game sessions. 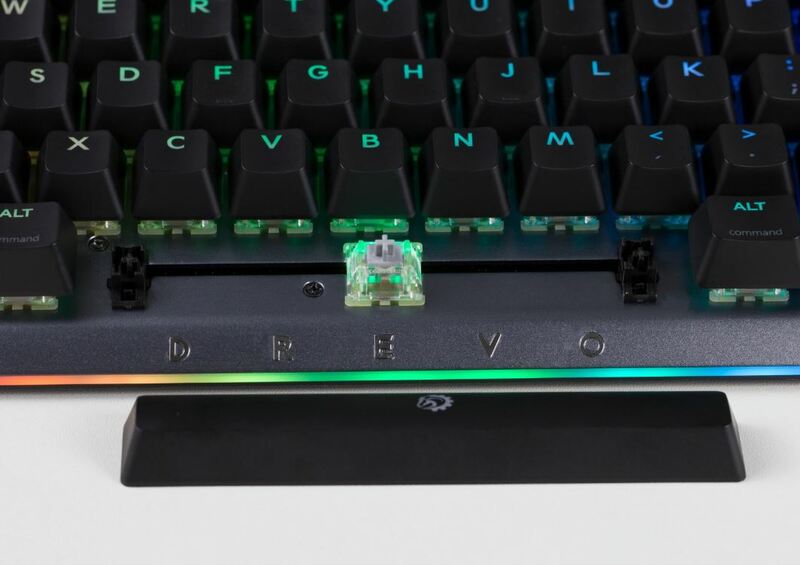 Drevo has clearly put a lot of thought into the design because if all feels very intuitive. With the BladeMaster, Drevo aimed to create the perfect mechanical keyboard, and they have done a darn good job. 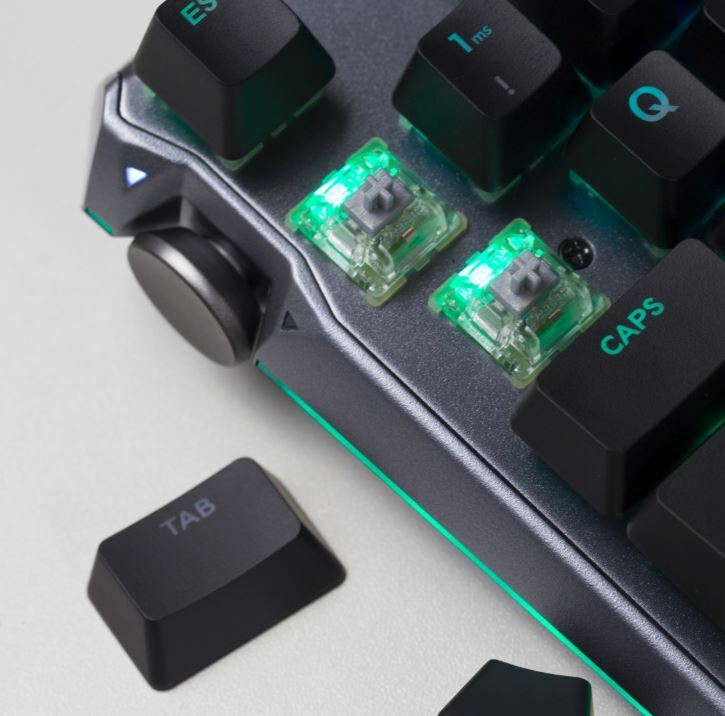 This device features all the specs that mechanical keyboard nuts look for, including TKL, RGB lighting, multiple profiles, powerful software, sleek design, wireless connectivity, one-hand control and productivity features. If you’re in the market for a new mechanical, you’re not going to find a better option than the Drevo BladeMaster. If you’re not quite ready to take on the PRO model, the TE model features many of the same features, but at a significantly decreased priced. There’s no wireless connectivity and it features Gateron switches instead of Cherry switches, but it’s still a darn good keyboard. There’s no doubt that Drevo’s 14 months of market research were very productive. They’ve tried their best to include everything we want out of a keyboard and we can’t say that they’re far off. If you have the chance, give the BladeMaster a try. You can also get your hands on one by contributing to their Kickstarter. Any words on batterylife on this thing?